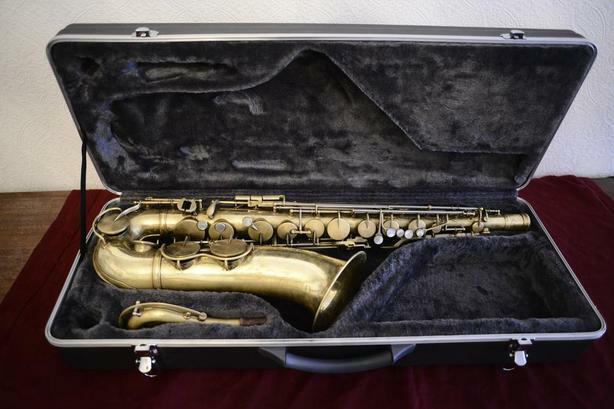 King Zephyr tenor saxophone. Serial #269xxx, dates from late 1945/early 1946. Somewhere along the way it was stripped of its original lacquer and is now bare brass. Has some patina and minor tarnish, but a overall nice natural vintage brass appearance. A good player's horn. Has Jim Schmidt Gold pads. Original thumb-rest was replaced with an adjustable one. Was set up at L&M last year by Chris Watt and he adjusted the key heights, smoothed out a few small dents and fixed a couple pad leaks. Selling only because my son needs something with more modern ergonomics. This is a well-made, great-sounding horn in nice playing condition. Would suit a player who wants that vintage feel and sound. Includes hardshell case and brass body cap. $1550 firm. This is Final price reduction before this horn goes on the auction site. No trades. Thanks for looking.